Fresh, Natural and 95% organic. Your health is as important as ours. 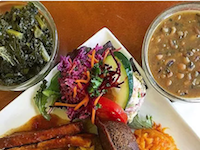 We have been perfecting home cooked vegan cuisine for over 15 years in an effort to share health through food. We are firm believers that the food you choose to eat is directly related to your well being.